Grasp & Teether is rated 4.4 out of 5 by 26. The Grasp & Teether toy by Bright Starts helps your baby teethe with ease. 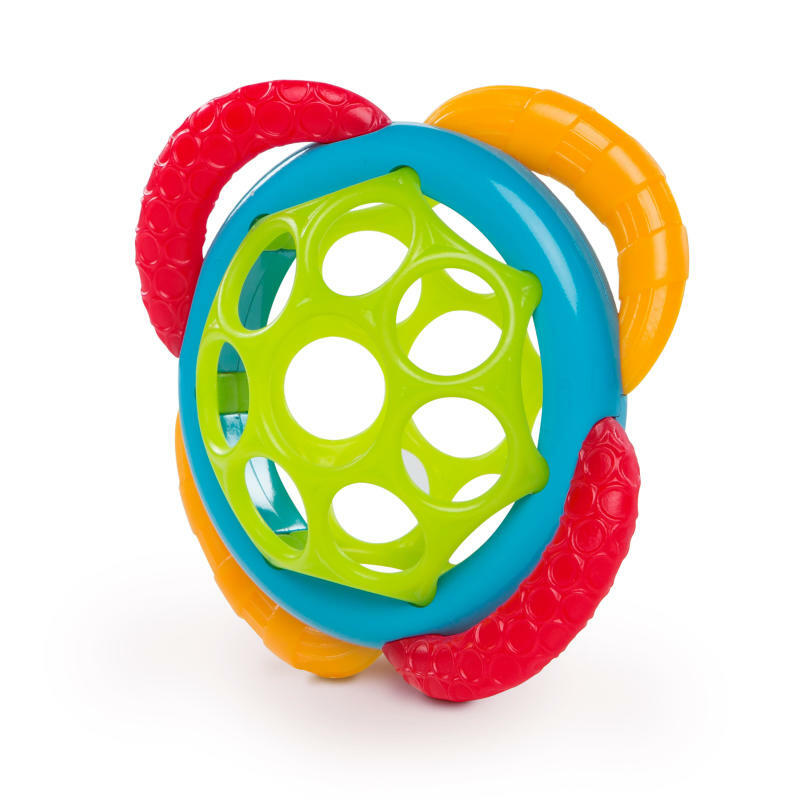 Made with signature Oball material, this virtually indestructible teether can handle every chomp, nibble and chew. Different ridges and textures along the little loop handles help massage your baby sore gums. It’s easy for baby to hold on and self-soothe, thanks to Oball’s grippable material and finger holes. With relief like this, your teething toddler will be back to big grins and giggles in no time. Dimension (in) 5" x 2" x 5"
Wipe clean with damp cloth and mild soap. Rated 4 out of 5 by Brobinson from My 5 month old loved to play with this when he was in his car seat. Lots of little crevices to hold on to and held up to a lot of teething chewing. Rated 4 out of 5 by Brobinson from My 5 month old loved to p My 5 month old loved to play with this when he was in his car seat. Lots of little crevices to hold on to and held up to a lot of teething chewing. Rated 2 out of 5 by Oballaddict from Oball missed the mark on this one I own about 95% of all oball products and I love them all. I get very excited when I see new oball products so I got this immediately but I'm very disappointed. The semi circles are very hard wish they were made of the typical soft oball material and the sides are not even big enough to clip an o link on, which is important because we know babies like to throw their toys and no one wants a toy meant for the mouth hitting a dirty floor! It doesn't make any noise and seems rather boring compared to the rest of the oball products. Rated 4 out of 5 by GAMama from Our family is a huge fan of Oball toys but this one is just OK. The colors are engaging and while the main part of the toy is easy to grip, the sides are hard to hold on to for my infant. He wants to teethe on it but cannot get a good grip on the sides therefor he grows bored with it easily. The quality of the teether is excellent, like the rest of the OBall line however, I would choose some of the other toys over this one. Rated 4 out of 5 by GAMama from Our family is a huge fan Our family is a huge fan of Oball toys but this one is just OK. The colors are engaging and while the main part of the toy is easy to grip, the sides are hard to hold on to for my infant. He wants to teethe on it but cannot get a good grip on the sides therefor he grows bored with it easily. The quality of the teether is excellent, like the rest of the OBall line however, I would choose some of the other toys over this one. Rated 4 out of 5 by gtg543w from Yet another great product from Oball This is a perfect size for little hands. I love the Oball idea of the "mesh" which lends to an easy to grasp from every angle kind of toy. It is billed as a teether--my daughter did briefly chew on it, but she seems to prefer slightly softer teethers (silicon based toys) versus the harder plastic toys like this. Despite the fact that my child doesn't seem particularly interested in chewing on this, she does seem to enjoy picking it up, shaking it, and transferring it from hand to hand. Overall, another win from Oball.